The patented hinged lid on these tubes eliminates any danger of leaks. 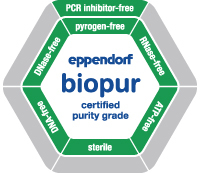 Eppendorf Safe-Lock Tubes guarantee absolute safety during work with expensive or toxic samples, radioactive substances or DNA. The test tubes have a graduation scale and a writing surface. A small hook on the hinged lid clips around the rim of the test tube. The lid hook prevents the tube from opening accidentally (e.g. during temperature-control processes). Tubes can be autoclaved when open (121°C, 20 min). Can be easily and single-handedly openend.